MarBorg offers commercial collection services and equipment with cans, carts, or bins. Cans are available in 32-gallons for backyard service. Carts are available in 35, 65, and 95-gallon sizes. Bins are available in 1.5, 2, 3, and 4-cubic yards. Roll-offs and compactors are available for large-volume trash producers. We will customize your level of service, including your container sizes and number of weekly pickups, to uniquely suit your company’s needs. Service will be provided 1-6 days per week, on a schedule that works for your business. On your scheduled service day, please ensure that any enclosures are unlocked and that full access is available for our drivers. In some cases, this means that you will need to push your bin out to an accessible location. Please call the office for details regarding your specific location. All containers are color-coded based on the type of material allowed in the bin. Beige containers are for trash, green containers are for greenwaste, and blue containers are for recycling. What can I put in each container? Click here to learn more. Businesses located in the City of Santa Barbara are also eligible to participate in the new Foodscraps Composting Program. Please click here to visit Santa Barbara’s foodscraps website, call the City of Santa Barbara Environmental Services Division at (805) 564-5631, or call MarBorg at (805) 963-1852 for more details. On July 1, 2012 mandatory commercial recycling went into effect with the law known as AB 341 (Assembly Bill 341). 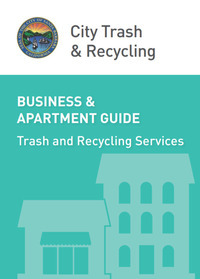 This law requires all businesses (including public entities) and multi-family residential dwellings of five units or more to arrange for recycling services. Your business may be subject to additional recycling requirements depending on location and the amount of waste generated. If your business does not currently recycle, now is a great time to start. Call MarBorg today to see how you can divert material from the landfill while reducing your monthly trash bill. For additional details about AB 341, see below. To reduce greenhouse gas (GHG) emissions by diverting commercial solid waste to recycling efforts and to expand the opportunity for additional recycling services and recycling manufacturing facilities in California. In 2014, the State of California adopted AB 1826 (Assembly Bill 1826), a mandatory commercial organics recycling law that took effect in 2016. “Organic waste” means food waste, green waste, landscape and pruning waste, nonhazardous wood waste, and food-soiled paper that is mixed in with food waste. As of January 1, 2017, businesses (including public entities) and multi-family residential dwellings of five units or more units that generate 4 cubic yards or organic waste per week are mandated to recycle their organic waste. To learn more about AB 1826 and how to comply with its requirements, please call MarBorg today. AB 1826 is phased in over time and targets the largest organic waste generators first, with the long-term goal of keeping organics out of California’s landfills. Organics buried in the landfill release methane gas, which is much more harmful to the environment than carbon dioxide. April 1, 2016: Businesses that generate eight cubic yards of organic waste per week must recycle their organic waste. January 1, 2017: Businesses that generate four cubic yards of organic waste per week must recycle their organic waste. January 1, 2019: Businesses that generate four cubic yards or more of solid waste per week must recycle their organic waste.